They are trying to fundraise $30 a pallet [there are 3,000 pallets]. This is a people power event venue – organised by the community like Newtown’s Festival – Please help spread the word. Gap Filler’s Pallet Pavilion was built in late 2012 by 250+ volunteers using 3000 wooden pallets. 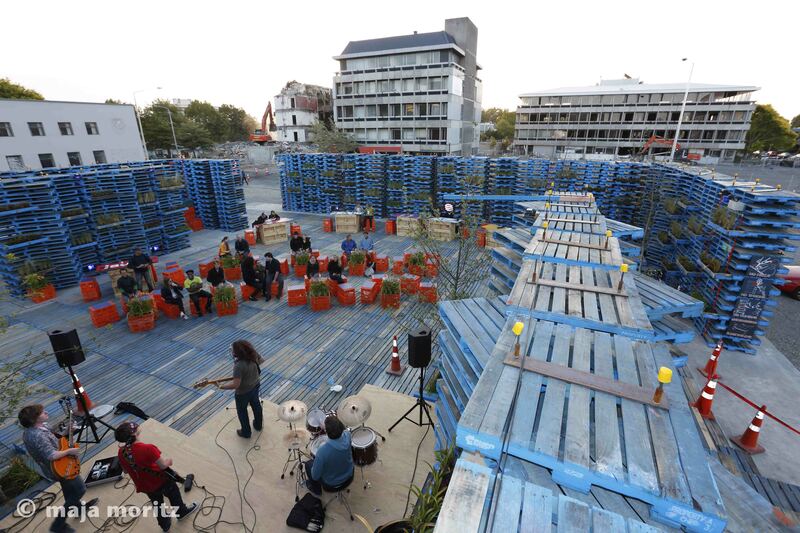 It was conceived to respond to the loss of venues for live music and community events in post-quake Christchurch. An extremely ambitious project, it has been an incredible success. It has had amazing media coverage, too with features n Australian Geographic, Cuisine, the Daily Mail, the Weekend Australian and more. More than 25 000 people have visited in just 5 months and it has hosted more than 100 events from live music to markets to children’s parties to lectures. 45 volunteers have contributed to it running across the Summer. The Pavilion is a temporary project and its deconstruction was due to take place in May this year. So NOW in other words. But across March and April many people have asked if we can keep the Pavilion in the space for another year. But Gap Filler can’t afford to keep it. So they’re putting it to you, their friends, fans, supporters and community to help raise the money needed and also spread the word. If you would like to support the Pavilion please go to https://www.pledgeme.co.nz/1064and watch a beautiful little video about it. This is Gapfillers public campaign where they are trying to raise $80 000. As well as the film, they’ve organised some special rewards for all those lovely people who can give to the campaign. Gap Filler thank you for your support. Even if you can’t donate yourself, please share this with as many people as you can. The only way we can raise the money we need is through the community pulling together in a combined effort, much like the way in which it was built.